Framing is virtually complete for the kitchen and mudroom addition we designed on Union Street in Northfield. 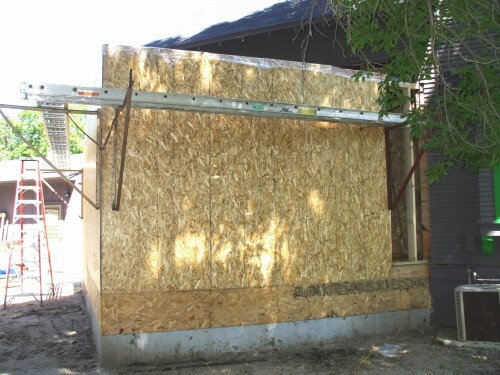 This shot shows the diminutive size of the addition that will greatly enhance the functionality of this home. It is a bit like a gift waiting to be unwrapped; windows and doors will be cut in soon, allowing the passerby to glimpse the exposed structural steel and tongue-and-groove fir ceiling deck. The addition is decidedly modern in character, intentionally distinct from yet sympathetic to the original home. It will feature a plantable green roof that ducks under the existing exposed rafter tails. The angle opens the view to the back yard and retains access to the garage behind. Taylor-Made Builders is doing a nice job with the construction work and the attention to detail an older home project requires.